Day One: Floor and surface clean 1 room. I decided to clean the floor in our “backroom,” you know that spot in your house where everyone dumps stuff. Well the floor was really hard to spot!!! But I thought if I just focused getting to the floor and getting it mopped that would be enough for me. 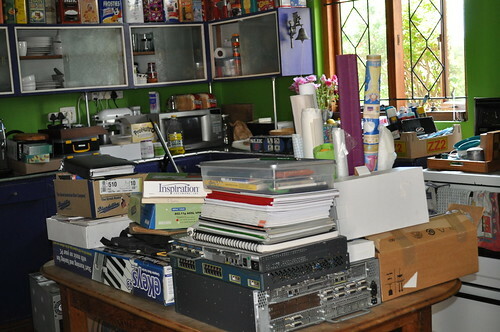 Turns out it took me twenty minutes to unpack… and then I got the kids to help and we had a mad scurry of putting things back where they belong – back on the right shelf in the right room… really that was what most of the mess was!!! Mopped… dusted the surfaces and packed everything back so that we could use the table for lunch. Wow!!! Not exactly twenty minutes, but something I have been putting off for ages and now it’s done!!! Day Two: Buy Flowers. 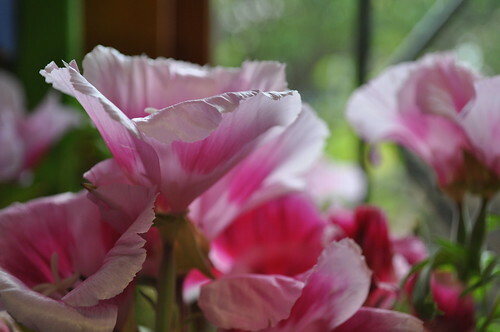 I actually got the flowers the day before – on account of the previous job being so well done!!! But I am sure that counts!!! Day Three: Find Inspirational Photos. I got this book for my birthday and haven’t even cracked open the cover… well now I have!!! 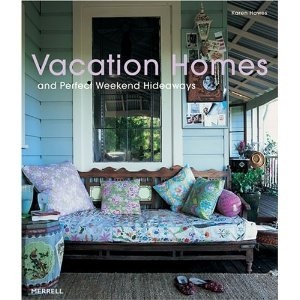 We never go away so I so want our home to look like a lot more like a holiday home, you know bring the holiday to us. Day Four: Remove 1 Item & SetUp Outbox. After an easy day I was ready for a bit of madness and even got the father person to join in!!! We just walked from shelf to shelf taking off books we didn’t love anymore… not exactly rocket science and so much easier to do together!!! I always wonder: “Does he/doesn’t he still want this book?” And he always says he wants all the books, so actually roaming along the spines together really helped to clear some shelf space!!! We got a good haul of donatables… plonked in our too donate spot at the front door… I must just keep them walking out before any of them find themselves back on a shelf!!! Day Five: Buy and Replace Eco Cleaner. Well I sorted our cleaning products the day I did the backroom. We don’t keep our cleaning products where the kids can reach them – I don’t care if they are biodegradable and safe to eat by the last remaining tiger on earth, I don’t want my kids drinking a bottle of cleaning fluid, or worse a visitors kid imbibing!!! So in the back room, which is off the kitchen, and on a very high shelf. Anyway, instead of cleaners I gave the kids a fabric scrap project to do and I sorted through fabric scraps that have been exploding out of their box for the longest time and an entire garbage bag of ancient scraps have been donated to friends and our scrap box is back under control and magical!!! This one is so much easier for me, somehow our kitchen is under control. I think because we live in it, I think because I let my kids sort the cupboards constantly. And I am always purging anything I don’t need from it. The kitchen cure has weekly assignments and I have been doing them over the weekends. They have been fairly harmless so far and I am hoping it continues this way!!! Week 1: Clean Fridge, Freezer and Pantry. 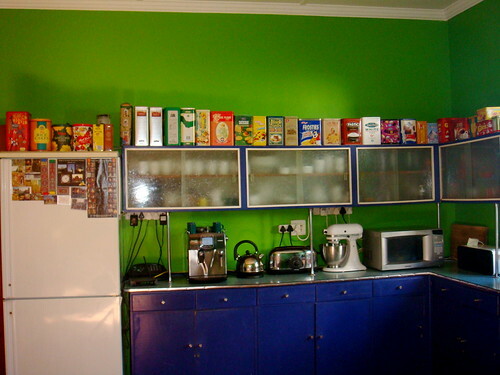 Our pantry is really a shelf where things get forgotten at the back… and so it was a quick toss of expired things and then a lurch through our tin cans… where I hide things for baking or surprises and then forget about them!!! The fridge was easy enough… a sort through the father person’s million condiments and I was done. Week 2: Clean Out Tools & Gadgets. Well our gadgets are pretty under control but our tools could sure do with a scrub!!! How does a dishwasher get so grubby around the rim? I am seriously cleaning a kitchen gadget each day this week… Dishwasher, KitchenAid, under the microwave, the crumbly toaster (hate that one – I would rather not own a toaster),… you know all those places that everyone else keeps clean and sparkling!!! So that’s our first week of the cure, done and dusted!!! I hope I keep going because it will be so cool to have so many tasks out of the way. None of them take long, but all together they are overwhelming!!! I am hoping by just tackling a little but everyday I will get the breath of fresh air I need and the satisfaction of another little place sorted. And room/time to be a little more creative at the end of it rather than always spending time on maintenance!!! Hoping I manage to go the distance and don’t get too distracted by all the other things I could be doing with my time!!! Now if there was just a Garden Cure, because what isn’t happening out there in my jungle isn’t really worth knowing about!!! Hay KM, I so hear you!!! I would much rather be playing…MUCH MUCH rather… But there is a certain amount of satisfaction in getting things sorted and how nice it will be when its over and I won’t have to say… I’m too busy to play. Lots of love to you!!! Found some left-overs from dresses for Hood #3 but they will have to be used in other projects, or donated to my friendly charity. Oh I loved reading this post. You have given me inspiration to start my own clean-up at home. I keep putting it off! And I love the photo of the condiments – all in height order – very impressive!!! Oh Irene!!! Happy sorting!!! 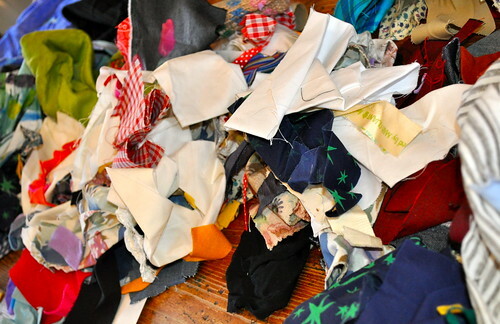 Our scraps are now in a big box ready for projects… the ancient trousers and old vests are gone!!! Our exploding box and surrounding carrier bags have been whittled down to a box of hidden treasures!!! What a pleasure!!! Have a nice day!!! Oh S – So glad I could inspire!!! You should see my house today – you would be inspired to move galaxy!!! Life’s like that sometimes!!! Have a good week!!! “donate spot at the front door,” we have a spot there too right now piled with books to donate. 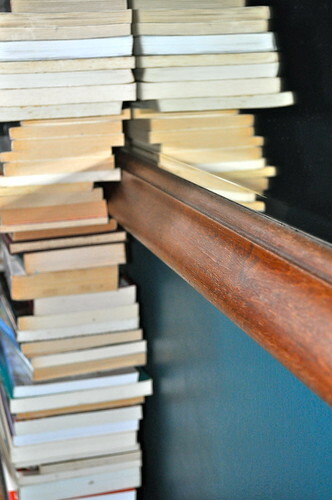 I have noticed though that some books have “walked away” and made new homes; need to get that pile outta here! I love this post, I think I can handle 20 minutes a day. Thanks for the inspiration! Hay 5OrangePotatoes!!! I think the fact that I declare those 20 minutes as my time really helps!!! It is so easy to do something for me – after all!!! Our donate pile used to get little feet, but now I try and get rid of stuff on the day… sort books and then a trip to the library to drop off and so on… Anything that lingers just reverts!!! You have a great week!! !